"In Unison" is a collective exhibition featuring 20 talented D.C. artists. 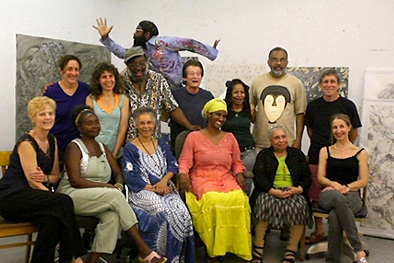 This group was organized by Juanita & Mel Hardy of the Millennium Arts Salon in D.C., and was facilitated by Helen Frederick and the George Mason University Printmaking Department. Twenty artists who work in various mediums were invited to take part in this event. 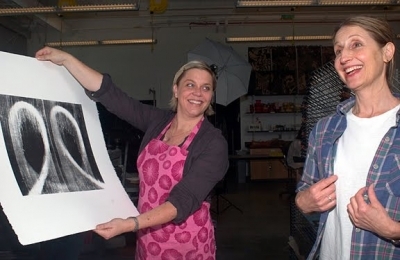 Many, if not most, of the artists were unfamiliar with Printmaking, so several students within the GMU Printmaking department offered their help and expertise to assist visiting artists in creating a total of 7 prints per artist for this event. It was a wonderful opportunity to work with many well known D.C. artists. I primarily worked with Paula Crawford and Yuriko Yamaguchi but also helped with others. I cannot express how much fun it was to work so closely with such amazing talent. "The Kreeger Museum is proud to present In Unison: 20 Washington, DC Artists. The exhibition is a result of a project initiated by the renowned Washington, DC artist Sam Gilliam who invited 20 artists from the community, working in different styles and media, to come together to make a series of five monoprints, one of which would be selected for the show. Curating the selection of prints were Judy A. Greenberg, Director of The Kreeger Museum, Marsha Mateyka of the Marsha Mateyka Gallery, Claudia Rousseau, Ph.D., art critic and art historian and Sam Gilliam. Counted among the participants are painters, sculptors, digital media and installation artists and a few printmakers, all established names in the DC region. Each was challenged to make monoprints in the welcoming environment of the print studios at the George Mason University School of Art. 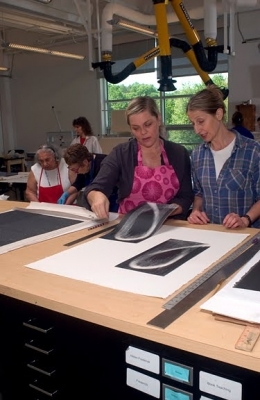 Printmaking is traditionally a collaborative art form. This enriching experience provided opportunities for interaction among the artists and promoted a true sense of collaboration." 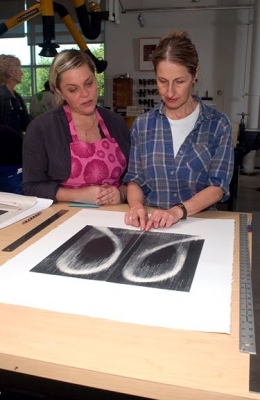 The Kreeger Museum has always supported and encouraged artists in the DC metro area. Director Judy A. Greenberg states, "We are pleased to exhibit these 20 monoprints by outstanding talent whose work clearly shows the extended range of style and expression found in Washington, DC." The exhibition is sponsored by the Millennium Arts Salon which has been serving the Washington, DC arts community for 10 years. The exhibition was on view at The Kreeger Museum from January 15-February 26, 2011. For further information regarding this collection please contact Juanita Hardy. Some of the crew working to help out with the Millennium Artists at GMU include: Helen Frederick (also participating artist), Susan Goodman (also participating artist), Ann Klopfenstein Burdell, Meaghan Busch, Nancy Mitchell, Betsy Patten, Patrick Sargent, Kelli Sincock, Erwin Thamm, and Richard Wenrich. Below are some pictures that the talented John Woo shared with us. Thank you so much John!